I know I’ve been promising the end result to the room for the grandkids that I’ve been working on over at my mom’s, and I’m happy to say that… it’s done! You can see the finished grandkids room here. But there’s more good news! 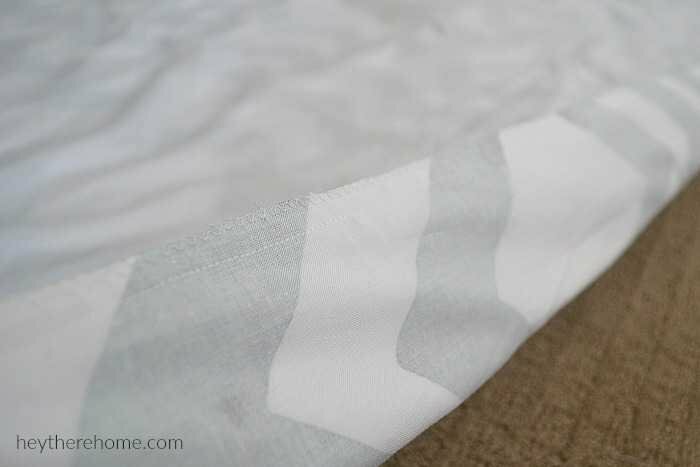 I’ve got some great projects that went into the room that saved us some moo-la and I’m going to show you today how to make a duvet cover, even if your fabric isn’t wide enough, cause being able to use this amazing fabric really made this room pop! Doesn’t my little lady look cozy? She’s fake sleeping pretty well don’t you think? Ok. So the hardest part will be finding a place to lay out a giant piece of fabric. I promise. For my duvet cover, I used fabric for the top layer and a white flat sheet for the bottom layer. I did this to save money. This is for a twin sized duvet cover. 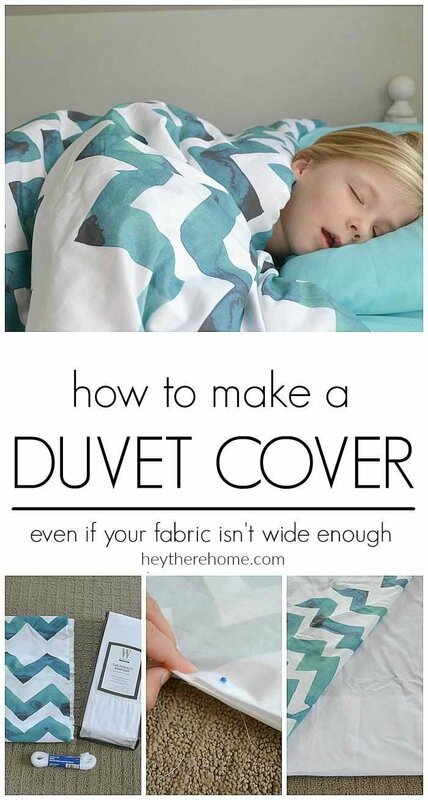 You’ll need to adjust the amount of fabric you need according to the size duvet cover you’ll be making. First I took measurements of my insert and added 4 inches to both the width and the length to allow for 1 inch seams all the way around and be able to fold over the edge that the velcro is on. Because my fabric was only 42 inches wide I had to get extra to put panels on either edge to make it wide enough –you’ll see what I mean in the next step. For the back side (where I used a flat sheet,) I added another 6 inches to the length to allow for the pocket along the velcro edge –that’ll make more sense to you in a minute too. Example: My insert measures 63 x 86 inches. So for my top layer I created a 67 x 90 inch piece, and for my bottom layer I cut a 67 x 96 inch piece. Because my fabric was 42 inches wide I added panels on each side to make it 67 inches. I cut out two 13 1/2 inch wide panels –trying my best to keep the pattern aligned. Then I laid each panel onto my 42 inch wide piece, print side to print side, and sewed down the edge with a 1 inch seam. Now I have one big 67 inch wide top layer. Now you need to prepare your bottom layer. 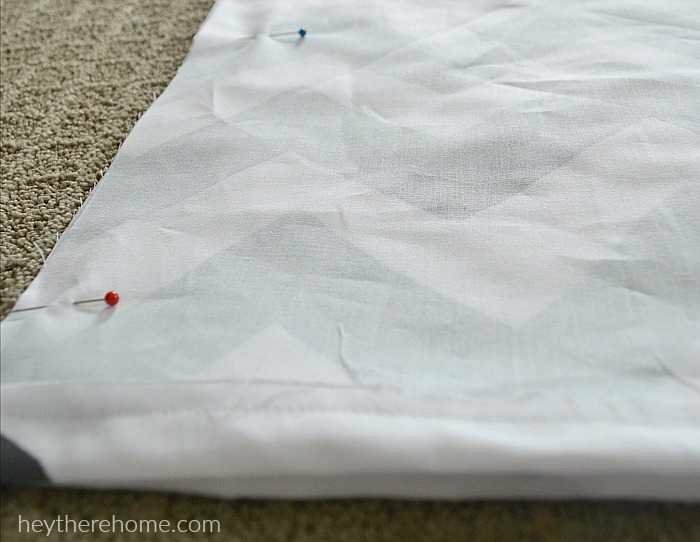 Cut a piece from your flat sheet that’s the same width as your top layer but 6 inches longer than the original top layer before you folded in for the seam. Mine is 96 inches long. 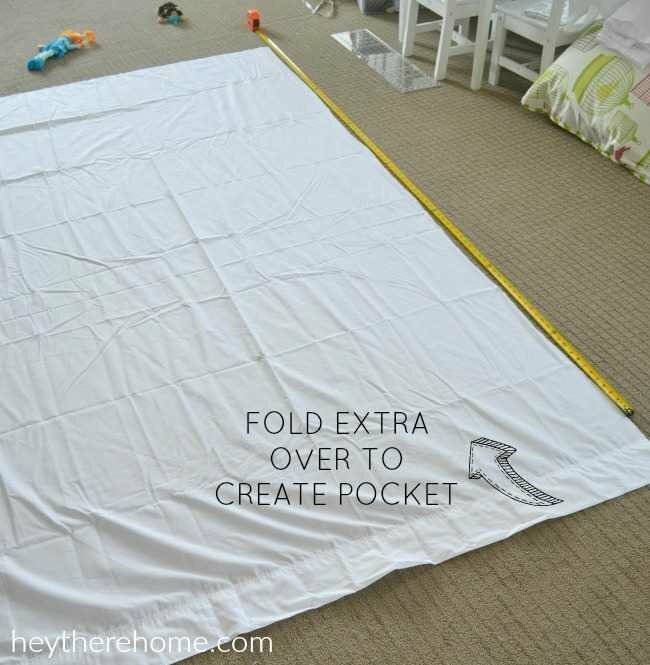 Now fold the extra 6 inches over to make a pocket and make sure it’s smooth. 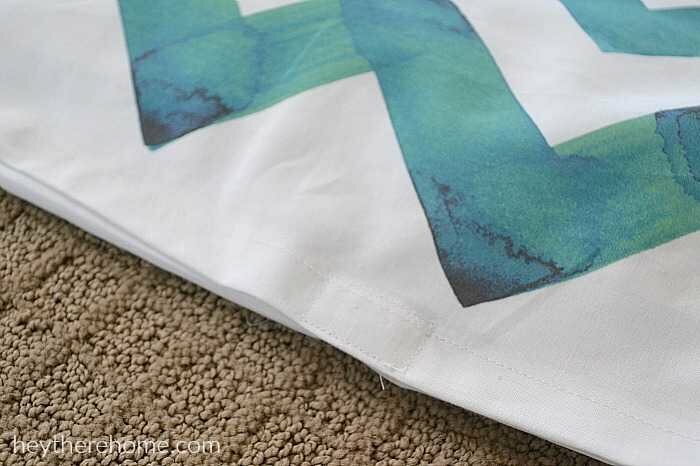 Lay your top layer (print side down) onto the bottom layer and pin all the way around on the 3 sides, not pinning on the side with the hem and pocket. Then sew it together with a 1 inch seam. Serge the edges so that it won’t come apart in the wash.
**If you don’t have a serger, simply run it through the machine again with the zig-zag stitch making sure that it catches the fabric on one side and the needle lands just outside the fabric on the outer edge. 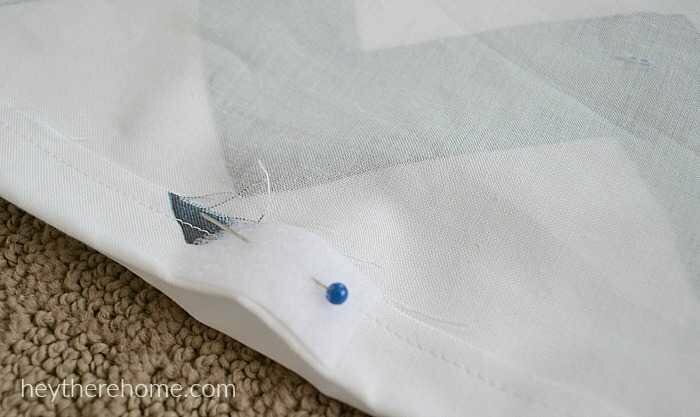 To keep the bottom portion of the duvet cover closed I added small pieces of hook and loop about every 10 inches. With my duvet cover still inside out, I simply cut about a 1 inch piece and then pinned one side (the hook) to one layer and the other side (the loop) to the other layer directly under it. Then I ran it through my sewing machine to keep it in place. Now it’s time to turn that sucker right side out and add your insert making sure that you tuck it into the pocket you created (by folding those extra 6 inches over) on your bottom layer and press the velcro together. And that’s it! Now your possibilities for bedding are endless! Pin the image below by hovering over it! So I finished the duvet with extra layer inside and I’m pleased with it considering I’m just a beginner at sewing. I found a set of queen size sheets at a thrift shop for $5 and used the fitted one for the navy squares and the flat one for the inside layer. I bought a new flat sheet for the back layer. And the print squares are from the duvet that was ripping. I’m trying to attach a picture but struggling with that. Sigh. I really want to make one since I can’t find a duvet that I like. But I have a King size bed. Any suggestions on how to do it?? Great question! You could do 3 panels across. The widest (as wide as your fabric will allow) will be in the center with the two side panels being equal. Have an awesome day! Thanks Corey! How about the bottom? Do you think a king sized sheet would be too small? Hi, thanks for sharing this idea. I have never seen a duvet cover with a pocket but it makes perfect sense. One question though, do you not need to serge the edge of the pocket that is folded inside? It doesn’t mention this, but I wondered if also necessary? Great question, Tracy! I used a flat sheet so the edge was already taken care of (it’s the top part of the sheet.) But if you don’t have that you’ll want to make sure it has a clean seam, so yes you’ll want to serge it so it lasts through washes. You’re so welcome Rinda. The pocket goes inside so that the duvet insert goes in it and then the two edges come together with the velcro squares. This keeps the insert from popping out and gives a really nice finished look. Hope this helps! I can’t figure out the pocket thing . It seems too long for the rest of the cover. What is wrong? Hey Mary, You fold it in to the length of your top layer but the pocket is in the inside. The duvet insert goes into the pocket but the outer layer of the duvet cover doesn’t. It’s just to hold the insert in place. Hope this helps! 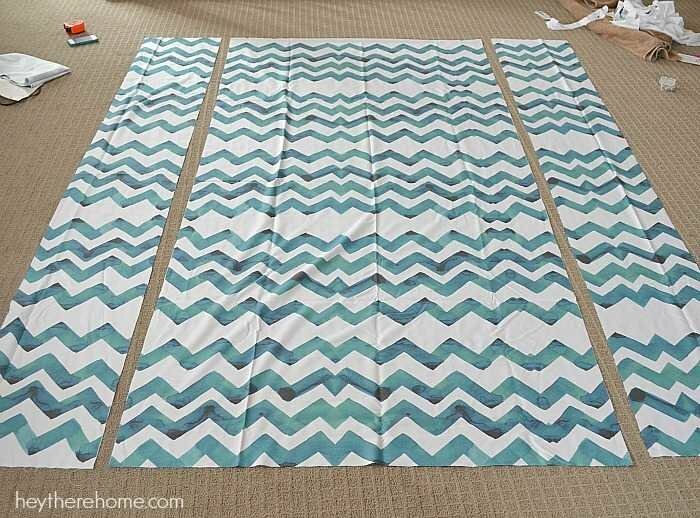 I was thinking of making a duvet cover where the top is pieced together quilt blocks and then a border(binding) strip around them. What would you recommend to do so that the top layer is not all open seams showing all the time? Possibly an extra layer of material (bed sheet) in there?? I just completed three of these, Thanks for the pattern. They turned out beautifully. I used Mountain Magic spoon flower fabric, but one thing you have to be aware of is shrinkage. I pre-washed the fabric and it shrank. Also the pattern printed on the fabric doesn’t go quite to the edge. So I ended up with 176″ x 41.25″ (instead of 180″ x 42″) – The width was not a problem as I was piecing it. For the Length I would advise buying a little extra – say 5 yards and 8 in. With some creative adjustments for hemming and some smaller seams, it worked out fine. I used double (full) sheets as they were plenty wide enough. Thanks for the great suggestions, Bonnie! So happy for your success with three duvets! Cheers! What size bedding does this make ? Twin ? Queen? Hi Vanessa, This was for a twin sized duvet cover. You will need to adjust the amount of fabric you need according to the size duvet cover you will be making. Wow!! This was the page I have been looking for! I want to make my son a duvet cover and found an amazing Arctic print on Spoonflower. You have answered all of my questions. Looks like I better place my fabric order. That sounds perfect, Jenny! Good luck! I browsed Spoonflower collection and I am in love with them! They have a wide variety of fabrics with a cute design. But they don’t have fabric wider than 42″, I see why you have to add extra panels. You make this seem so easy, but I don’t if I can make it as neat as yours but it is worth a try cus yes I cut me some green! Thanks for sharing and check us out, maybe, thanks! Thanks so very much, Jessica! About to order from Spoonflower for a duvet cover. Which type of fabric did you order? Is this made with the basic cotton? Hey Amanda. Yes. It was basic cotton. Thanks Tanya! Happy to have you here! Would this work with a regular queen blanket? I put my blanket in the wash and for some reason, the bottom corner bunched together and I figured if I’m cutting it open to fix it, I may as well turn it into a duvet. Hi Katrina. I think it definitely would work with a blanket! This is beautifully explain ! I still have 1 question : wich type of fabric did you choose at Spoonflower ? Hey Myriam. I used the basic cotton and it was great! I would really like to make this. We have a king-sized water bed, so I know I have my work cut out for me. (Pardon the pun.) However, we also have a king down comforter, so it will be a work of love. I am looking forward to starting it. I just hope it comes close to looking as nice as yours. Thank you so much for taking pity on us and helping me out. Hope you have a great day. Did you make a twin duvet? 5 yards seems like a lot. I’m making a twin duvet cover, my insert is 68X86. Hooray! You are so welcome! I love nurseries, and I agree, handmade is such a sweet touch. I ABSOLUTELY LOVE this idea! I can’t wait to try it! I do have a question, I am confused about the purpose/description of the pocket. Can you explain that a little more? So, so very cute! Thanks for sharing! Hi Carrie. The pocket is at the end that opens. It will keep your insert from coming out from between the velcro closures. Does that make sense? I can’t wait to see your finished project. I like to share them in my newsletter so please send a picture when you are done! Hi Jai! I would make the middle panel of your duvet cover the full width of the fabric and then the remainder width that you need will be divided by two for the 2 side panels. Allow 1 inch for each seam. Also, it is a great idea to use a queen flat sheet for the bottom side to cut cost. That way you don’t have to buy fabric for that side. Hope that helps. Let me know if you have any further questions! what is a duvet? And where do you get an insert? Hi there. A duvet is just the cover that goes over the insert. Typically inserts are down or imitation down filled. The alternative is a comforter which does not have a removable insert but is still thick or a coverlet, which is more like a heavy blanket. The duvet cover is just the fabric on the outside. It works like a giant envelope for your insert. You can find inserts in all price ranges. I like to find mine at Target or Macy’s when they are on sale. Let me know if you have any other questions. Have a great day! A duvet is typically a white comforter made with down or down alternative. They range in quality and price, but typically a nice duvet runs around $150+ for a queen size (less if you do not require cotton fabric.) You can find a cheaper one on amazon for around $50, but it won’t be very fluffy or soft. A duvet cover is just what it sounds to be. A cover (like a giant pillow case) with buttons, a zipper, ties, or even velcro at the open end to keep the blanket/duvet inside. There are also little ties on the side 4 corners of the duvet cover quite often, that tie to the blanket/duvet loops to keep the cover in place on all 4 corners. Duvet covers are great because you can change up your bedding decor as often as you would like simply by switching a cover! They aslo aid in keeping expensive duvets clean, avoiding expensive dry cleaning costs or over washing. Hi Corey – I couldn’t find that fabric or the fabric maker online. I’m just wondering what type of fabric it was…100% cotton, twill…? Oh my goodness, why didn’t I think of this earlier? I too have struggled to find a duvet cover that suits my master bedroom decor, and since they’re so expensive, it’s tough to settle for a fabric I don’t love. This is probably much more cost effective. And I can select a fabric color that hides the inevitable dog hair at the foot of the bed. Gross, but realistic. Hi, I love this so much! I pinned this a while ago but only just recently discovered spoonflower. I was just wondering whether you might be able to let me know what fabric type you recommend for making a duvet cover? Hi Julia. I think the cotton blend is perfect. That is what I used and it has held up great and the print/ color is vibrant. Spoonflower is so much fun! Hi Melissa. I did the standard cotton blend. 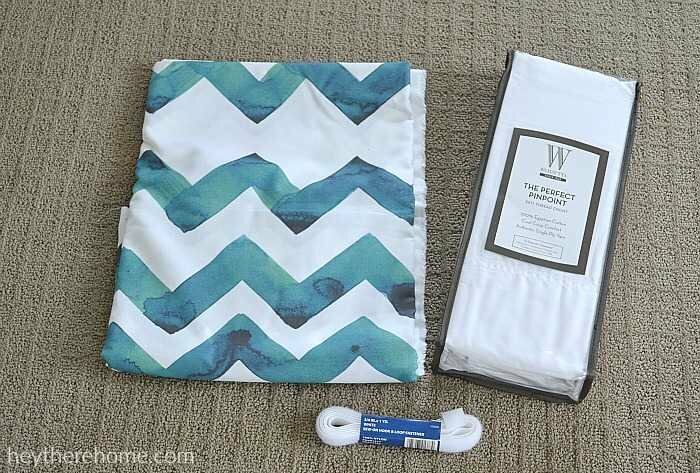 It is holding up great and is a good quality fabric perfect for sheets. Thank you so much for the tutorial! This is great & I can’t wait to get started on this project. Quick question though: The 5 yards is enough to fit a queen size bed, right? If not, how many yards would you suggest? Hi there! You will want to to know the measurements of the insert and then the number of yards will depend on the width of your fabric. Different fabrics come in different widths. The bottom side of the duvet is a flat sheet, so you won’t need fabric for that unless you want the whole thing to be your print. Hope that helps! Thank you so much for this awesome tutorial. I always wanted to make on for my mother but I have been afraid it is a bit big of a project for me. You have gave me confidence that I can do it. Thank you so very much. One of the things that bugs me about my current duvet cover is that it’s always wrinkled. Obviously 100% cotton fabric is super soft so it makes sense why they’re made of it. Trust me, I am no neat freak. (In fact I’m more A.D.D. than O.C.D!) I don’t know why my wrinkled duvet bugs me so much. But it seems like too much messing around to iron it everyday. Anyway, I have a question for you. How well do you think using a blended fabric would work? Or home decor fabric? There are so many beautiful choices! I’ve wondered if I could use one for something like this. I would still like to use a soft sheet for the back. Thanks for your vote of confidence, Corey! As soon as hockey and gymnastics seasons are over I vow to take some “me” time!.. I’ll post a picture of my finished project for you to see. Good or bad! 😉 If nothing else, it’ll be a learning experience! I just signed up to receive your emails. I’m really looking forward to getting them..
How fun to try it with a baby blanket! What kind of fabric did you use? Was it just quilting fabric or something else? Hi there love the tutorial but just wondering if I missed where it said what size this makes? Trying to make one for my queen bed but not sure of the measurements for fabric I would need!? Sometimes the insert won’t stay in the corners. To fix that, I sew a shoestring in each inside corner of the cover and another on the corners of the comforter (or whatever you use inside). Then I tie the comforter to the corners before turning right side out. That way the insert will stay in the corners. Where did you find a single flat sheet? I can only seem to find sets. I found the flat sheet at Bed Bath and Beyond. I love it!! What type of fabric did you pick from spoonflower as in organic cotton, linen, sateen etc? Thanks a bunch! Can you clarify if this is for a Queen duvet cover or twin? Thanks! Hi Krissy. This is for a twin duvet, but could be modified for a queen. You would just have the panels down each side be wider. I base my measurements off of the dimensions of my insert. Let me know if you have any more questions by emailing me directly. Have a great week! Hey, this came out great! Just a quick question – which type of fabric did you use? There are sooo many options on SpoonFlower and I don’t want to use something that ends up being too rough or heavy. Hi! I think I used the regular cotton blend. It was the 18/yd one. It wasn’t rough at all and is a tiny bit heavier than a sheet weight which is perfect for a duvet. Let me know if you have any more questions. OMG!! This is awesome. =) I’m definitely pinning this. Thanks Jessica. It really is a very easy project, even if you are a beginner. I’d love to see the result when you try it, so be sure to send me pics! Great job!! I LOVE the fabric you used. how did you keep the comforter from shifting inside? I’m trying to replicate this duvet, but I’m a bit confused on how you cut and sew them together. Wow, this is seriously beautiful! I love the fabric you picked out. Great tutorial! I totally need to make a duvet cover for my home’s master bedroom. I was going to wing it, but now I don’t have to! Can’t wait to pick out the fabric! Where did you get that fabric? I love it! Great job on the duvet! Hey There. This is a really well written article. Just to confirm, this makes a queen sized duvet cover correct? I LOVE this tutorial! Thank you for sharing. Hi Katrina. The duvet cover I made in the tutorial was for a twin sized duvet insert. You can modify it to make a queen size easily. Measure your insert and then add 4 inches to both the length and width to allow for your seams. For the bottom layer add an extra 6-8 inches to the length so that you can create the pocket for the insert to fit into on the end with the vlecro. I hope that helps. Don’t hesitate to ask if that didn’t answer your question. Have a great weekend! Super cute! Pinned to my sewing board that I invited you to on Pinterest! Thanks Diana. I’ll head over there now! What a beautiful job! Where can I find that fabric? Great tutorial, Corey! 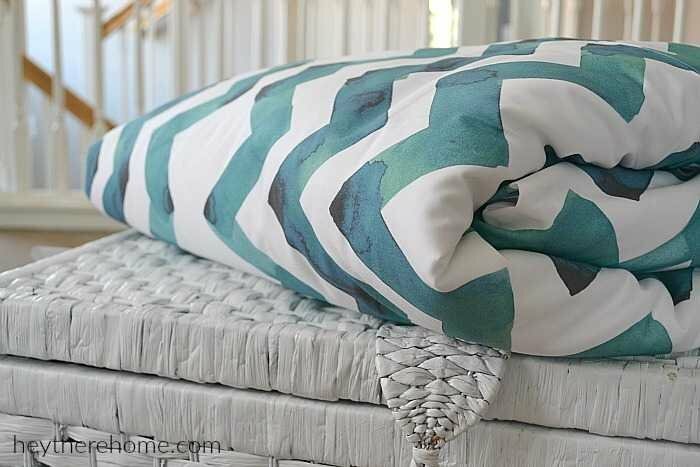 I love the chevron fabric you chose–so cute. Thanks so much for sharing this with my Frugal Crafty Home readers! I like the fabric you chose. You did a great job. Hi there, stopping by from the Hit Me With Your Best Shot link party at Made to be a Momma. This is a great tutorial! It makes me wish I could use my sewing machine while I’m overseas, but alas the voltage is wrong 🙁 I’m pinning it to save for later and following you on facebook and pinterest. Great idea…so simple too! Love the fabric you chose…this is now a definite on my to-do list! Ahahahaha with her mouth all open! That’s how I sleep ;X She did fantastic . Has anyone told you yet how great that fabric is? Thanks for showing how easy it is to make a cover! I was just at the store looking for a duvet yesterday and couldn’t find one. It never dawned on me to just make one. I think I’ll just buy 2 king size flat sheets and I can easily make one for my queen size blanket. Thanks for a great idea! What a pretty duvet! You’re right, your little lady does a mighty fine job of fake sleeping 😉 Great project and I’m pinning it right now, Corey. Thanks for sharing. Love the fabric you chose, Corey! So pretty! Love it. I’ve been wanting to do this for the master bedroom. I can’t seem to find the one but I see so many fabrics that I like and can use instead. That was exactly my dilemma! Making my own opened up so many possibilities…maybe too many! Thanks so much for stopping by! Master seamstress or not, you did a great job!! Hi Corey, I love your duvet cover! The fabric is awesome! Great job! Thanks for sharing! Thanks Shirley! Makes me so thankful that I’ve learned to sew so I can at least do some simple projects.